Bill Murray and Fred Armisen appear on "Saturday Night Live" Jan. 13, 2018. Billy Murray, Fred Armisen, and an accidental F-bomb each made appearances during the latest “Saturday Night Live” episode, returning from the winter hiatus with first-time host Sam Rockwell. 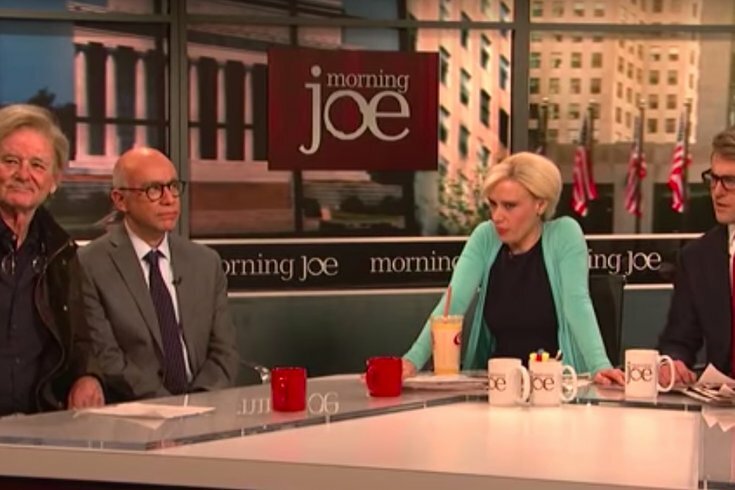 The show started with a return to “Morning Joe,” a spoof that’s been absent from the show for a while, this time tapping into big-name “SNL” alums Bill Murray and Fred Armisen to play Steve Bannon and Michael Wolff, respectively. After an opening monologue from Rockwell highlighting his Golden Globe win and crossover from character actor to leading man, complete with much dancing, the show started off with an otherwise unnoteworthy sketch, “Science Show,” where Rockwell plays a 1990s host on a kids show where he grows increasingly impatient with the kids he’s teaching. The full clip is here, but someone managed to snag the unedited broadcast of Rockwell saying, "You can't be that f*cking stupid." Rockwell accidentally cursing on the air puts him in the ranks of Jenny Slate, Jon Lovitz, Norm MacDonald, Ariana Grande, and many others who have slipped up during the show. Slate’s is the most memorable one of recent memory, unfortunately leaving to her eventual boot from the show after just one season. Leslie Jones and Chris Redd also appeared on Weekend Update as Oprah and Stedman Graham, respectively, to address that Oprah-for-president speculation. Coming fresh off the start of awards season, the Golden Globes provided much material for “SNL” as well. An E! spoof, “Fashion Panel,” featured fashion critics’ grossly misguided attempts at being empowering for women while discussing celebrities’ red carpet looks. Halsey was the musical guest of the night, performing “Bad at Love” from her album “hopeless fountain kingdom and “Him & I” with G-Eazy. “SNL” returns with a new episode next Saturday, Jan. 20 with host Jessica Chastain and musical guest Troye Sivan.